Buses that neither belch pollution nor draw on coal power are starting to appear on city streets, with the support of Silicon Valley and a company backed by Warren Buffett. Over the next six months, Seattle is rolling out two all-electric buses made by Kleiner Perkins-backed Proterra Inc. The city gets 95 percent of its electricity from renewables, mostly hydroelectric dams that don’t use fossil fuels. So charging the fleet won’t increase emissions. The trials, replicated in Dallas, San Antonio and Worcester, Massachusetts, show that battery-powered buses can move people more quietly and cheaply than traditional diesel models. While cities for years have embedded hydrogen and natural-gas vehicles in their fleet, the electric bus fueled by renewables holds the promise of delivering transport for the masses without damaging the atmosphere. “We’re pushing to get as green as we can,” said George Stites, supervisor of fleet services for King County Metro, which runs Seattle’s transit system. While all-electric sports cars from Elon Musk’s Tesla Motors Inc. have grabbed headlines and the attention of the public, it’s buses that are in many ways better suited for the technology. The girth of the bus can more easily absorb heavy battery units, and running them on set routes means charging cycles can be planned in advance. Lesser known companies such as BYD Co., backed by Buffett, along with Proterra and New Flyer Industries Inc. dominate the nascent electric bus industry. New Flyer has gained more than 20 percent over the past year in Toronto. BYD, based in Shenzhen, China, has slipped 28 percent in the past year in Hong Kong. City transit managers have long been ahead of the curve on replacing diesel vehicles. More than 41 percent of bus fleets were using battery, fuel-cell and hybrid technologies at the start of this year compared with just 2.1 percent of autos, according to the American Public Transportation Association. “We’re leading the way with electric buses the same way we have with other alternative fuels,” said Virginia Miller, a spokeswoman for the Washington-based industry group. Those figures include hybrids and natural gas buses as well as all-electric. 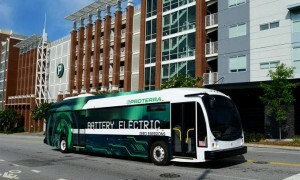 Still, the benefits of all-electric buses may be limited. Only 2.5 percent of U.S. commuters use buses, compared with 76 percent who use their cars. Recent battery improvements have made the new buses cheaper than diesel, with both lower lifetime fuel and maintenance costs. By 2020, 59 percent of the world’s transit buses will be electric hybrids and 12 percent will be all electric, according to analysts Frost & Sullivan. Chicago Transit Authority expects two electric buses it bought from New Flyer Industries will each save $300,000 in fuel costs and $660,000 in public health costs over their 12-year expected runs. That more than makes up for the $500,000 premium over the diesel buses that the electric ones replaced. They can run for 100 miles — a full day’s work — before needing to recharge overnight. CTA operates about 1,800 buses. BYD, the Chinese automaker partly owned by Warren Buffett’s Berkshire Hathaway Inc., projected it will sell as many as 200 electric buses in the U.S. this year after securing an order from Long Beach, California. The company has sold more than 5,000 of the electric buses globally, including 50 in in the U.S. BYD plans to sell about 6,000 electric buses this year. Their 60-foot-long bus can carry 120 passengers 190 miles on a single charge. Long Beach is adding wireless charging system at one stop, where each bus can get enough juice for to go another four miles during the seven minutes it takes customers to board. Electric buses cost more initially than diesel. Savings come over time with lower fuel and maintenance costs, said Michael Austin, a vice president at BYD in New York. The high entry cost has stunted demand from transit agencies because capital spending decisions are made separately from operations. “It can be hard for them to see the lower total cost of ownership,” Austin said in an interview. “If you look over the lifetime you get at least $500,000 in savings,” per bus. THE TECHNOLOGY involved in the controversial Cahill waste-to-energy plant is not commercially proven, said Professor Paul Connett yesterday when he appeared as a guest on VOB’s Brass Tacks Sunday programme. The American, who was invited to Barbados by the Future Centre Trust to speak at its town hall meeting today on gasification plants, told listeners that the processes described by Cahill had yet to be demonstrated. 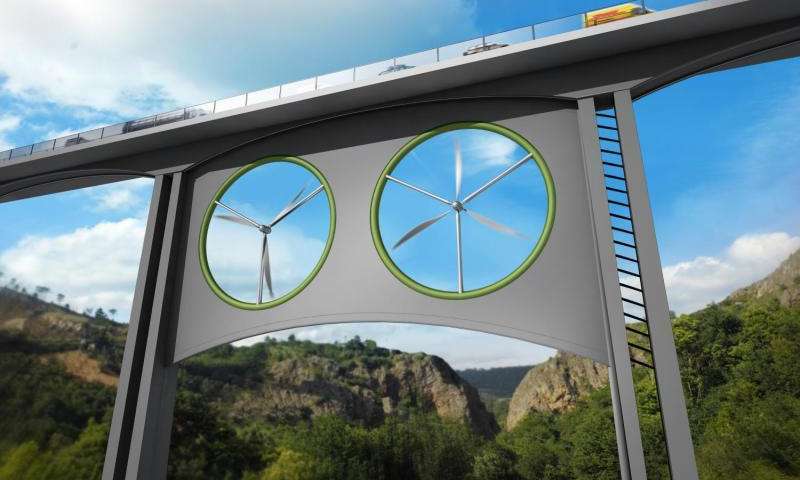 Wind turbines could be installed under some of the biggest bridges on the road network to produce electricity. So it is confirmed by calculations carried out by a European researchers team, that have taken a viaduct in the Canary Islands as a reference. This concept could be applied in heavily built-up territories or natural areas with new constructions limitations. The Juncal Viaduct, in Gran Canaria, has served as a reference for Spanish and British researchers to verify that the wind blowing between the pillars on this kind of infrastructures can move wind turbines and produce energy. The study is based in models and computer simulations, which were carried out by researcher Oscar Soto and his colleagues in Kingston University (London). Researchers have presented the wind turbines as porous discs in order to evaluate the air resistance and test different kind of configurations. “As natural, the more surface is swiped by the rotor, the more power can be produced; however, it was seen that in small turbines the power rate per square meter is higher”, explains Soto, who considers that the configurations with two identical turbines would be the most viable to be installed in viaducts. If only produced power was evaluated, the best solutions would be the installation of two wind turbines with different sizes – in order to embrace the maximum available space-, or even a matrix of 24 small turbines – due to their power production per surface unit and low weight-, but concerning to viability, the best option is the one which includes two medium sized wind turbines. Results confirm that each viaduct presents specific energy possibilities and wind potential. In the Juncal Viaduct case, the evaluated power would be about 0,25 MW per wind turbine. So, with two turbines, the total power output would be 0,5 MW, which is classified in the medium-power range. “This would be the equivalent to 450-500 homes average consumption”, says Soto, who adds: “This kind of installation would avoid the emission of 140 tons of CO2 per year, an amount that represents the depuration effect of about 7.200 trees”. This research has been promoted by the Canarian company ZECSA. Researchers from Vigo University have taken part to analyze the electrical connections needed to develop the project, along with other researchers from Las Palmas de Gran Canaria University, who were in charge of the integration in the scope of renewable energies “. In fact, the study has been published in the Renewable and Sustainable Energy Reviews and it is framed in PAINPER, a public infrastructures exploitation plan to boost the use of renewable energies. “PAINPER is an initiative which emerges from the difficulties seen in the implantation of this kind of energies in heavily built-up territories, as well as protected areas with low available space for new installations”, says Aday C. Martín, manager at ZECSA, who considers that renewable energy produced in wind turbines under viaducts could be added to energy from other wind, solar, geothermal and biomass installations. HR 2822, an appropriations bill, would “drastically” underfund core Department of the Interior programs and the EPA’s operating budget, the White House said. Both the House bill, and a similar Senate measure, indicate burning trees in power plants does not boost CO2 levels in the atmosphere if growth rate of U.S. forests exceeds the rate at which they’re cut. “But scientists have repeatedly demonstrated that burning biomass does increase atmospheric CO2 concentrations,” Lewis writes. Our first waste to fuels project, the Sierra BioFuels Plant, will consist of a Biorefinery where prepared MSW feedstock will be processed and converted into a low-carbon, renewable transportation fuel. Located in Storey County, Nevada, approximately 20 miles east of Reno where we have acquired and developed more than 19 acres of property at the Tahoe-Reno Industrial Center, the Biorefinery has been designed to produce more than 10 million gallons per year of renewable FT syncrude from approximately 200,000 tons of prepared MSW feedstock that would otherwise be landfilled. This renewable FT syncrude will be upgraded and processed into a low-carbon jet fuel product. Sierra will also include a Feedstock Processing Facility that will size, sort and process mixed MSW into a prepared MSW feedstock for use at the Biorefinery. Fulcrum has entered into 20-year MSW feedstock agreements with our waste service partners for the delivery of all of the MSW required for Sierra. The Feedstock Processing Facility will deploy a waste processing system that has been designed to extract high-value recyclable products and inorganic matter not suitable for processing from the raw MSW prior to preparing it for processing at the Biorefinery. Fulcrum has completed front-end engineering and site preparation activities on Sierra and permits are in place to begin construction, which is expected to begin in late 2015. In May 2015, Fulcrum awarded a fixed-price engineering, procurement and construction contract to Abengoa. Abengoa will be responsible for constructing the Sierra Biorefinery under this ECP contract that guarantees the cost, schedule and performance of the Sierra Biorefinery. The Sierra BioFuels Plant is set to begin commercial operations in the third quarter of 2017.